We have been in a series called Missing God that just wrapped up today. But before we move into the next series, this is a quick reflection on the last four weeks with some key points. You can always listen to past sermons or watch the videos on our Facebook page. 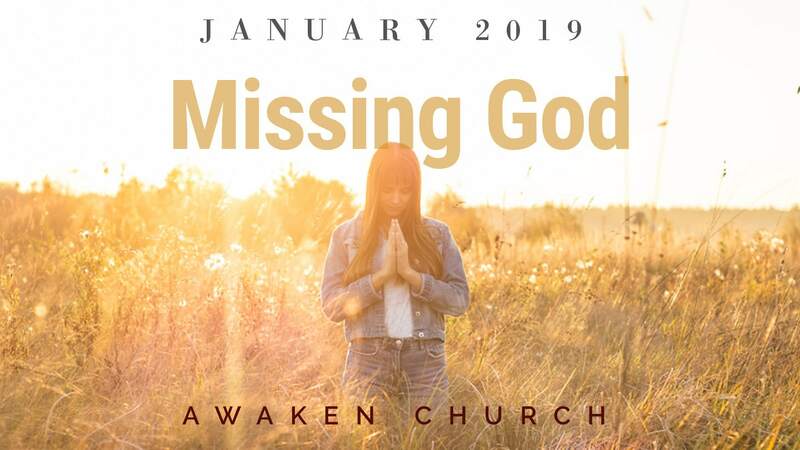 The entire premise of the last four weeks has been to help equip AwakenChurch to be able to hear God’s voice, discern His will, and obey what we’ve heard. This is all in light of the plan to have a church plant in Jacksonville in or around the Fall of 2020. I love that we are not just relying on the pastoral staff to see this vision made a reality – every member is a minister, so everyone needs to be listening to God’s leading on this. We are going to listen and obey together. Frank shared this during week one. God is always speaking. He is the initiator of the conversation and he is always speaking to us. He shouts His glory in creation, he gives us His Word, Jesus, the Holy Spirit, community, and so many other ways. We need to be familiar with what His voice sounds like and expect to hear it. We often live our lives in a “mall-like” environment, with lots of competing voices all speaking at once. But when it’s quiet, we tend to hear His voice better. Find those times and places where you can hear His voice and build them into your life, so when you are in a crowded environment, with lots of competing noises, you can know what He sounds like. What Does God’s Voice Sound Like? In the Old Testament, God spoke to his people through things like angels, visions, signs, dreams, whispers, and so on. But when He spoke, people knew what He was trying to say – God was not trying to be mysterious when He speaks. In the New Testament, God also adds in Jesus as a way He speaks to people – the incarnate Word of God – and the indwelling of the Holy Spirit. Since the beginning, God has wanted to walk with us and be with us. That’s how it was in the Garden of Eden, and that is what God is trying to restore. God is creative. He finds ways to speak to his people. You will find you are better at hearing God in some ways than in others. The goal is to hear and obey. To understand God’s Will in a bite-sized way, Frank shared three levels of His Will. God’s Sovereign Will: God being near His people, leading them, speaking to them, and transforming them is a big process. But the encouraging thing is that God is all-powerful and His Sovereign Will is that the relationship between God and man is restored – and nothing thwarts our God. God’s Expressed Will: This is God’s best plan for His people. The key difference is that we are able to choose or not choose to obey his expressed will. He says that we should forgive others as we have been forgiven, but people are capable of still holding unforgiveness. But the cool thing about God is that he weaves our mistakes and failures to follow His Expressed Will back into his master plan to redeem mankind. He is so good at redeeming our failures, it’s hard to imagine how it wasn’t part of the plan the entire time. God’s Personal Will for You: This is an answer that you’ll have to wrestle with. This is God’s will for your life – why He’s placed you here, during this time, in these circumstances, and built you the way you’re built. To answer this question, you’ll need to be able to know why you do the things you do (self awareness) and you’ll need to know God. Assuming you have heard from God – what next? It is always obedience. Not hearing is one thing – hearing and not obeying is something else entirely. Here are 4 key takeaways to help arm you for those decision points you’ll encounter when hearing God’s voice. It Doesn’t Matter What You Pray, If You Do Not Obey: Most of our lives are actually lived here – in having heard God speak in an area that we don’t want to obey Him in. But if God has spoken, your response must be obedience. If it’s not, then why bother seeking God’s will at all if you’re not going to follow Him when He speaks? But there is such liberty on the other side of obedience – it is always worth following where He leads. To Do Anything Great At All, You Have to Start Small: We have to be faithful in the little things before we can be trusted with the big things. Don’t try to skip over the things you already have in front of you to be faithful in and try to grab something else. God has given you people in your lives – neighbors, family, friends, coworkers, time, money, lunch breaks, etc. – that you can be faithful in first. To Go Where He Goes, Prepare to Get Low: Pride is the foundation of all sin and humility is the foundation of all virtue. Jesus called us to do our good deeds in secret, pray for our enemies, wash each other’s feet, etc. Pride is an insidious trick that can turn a humble act of service on its head just by the desire to be noticed and esteemed by others for having done it. Root it out at every turn. Jesus is going to have you get very low, and pride is a fragile thing that can’t make the journey. Direction is Not Always Destination: If God calls you to walk in a direction, go. But keep in mind that He often calls us to walk in a direction to get us in position for something else entirely. Keep an ear out for what God is saying along the way and respond as he calls you.